Beginning with the million-copy bestsellers "First, Break All the Rules and Now, Discover Your Strengths, " Marcus Buckingham jump-started the strengths movement that is now sweeping the work world, from business to government to education. Now that the movement is in full swing, Buckingham's new book answers the ultimate question: How can you actually apply your strengths for maximum success at work? Research data show that most people do not come close to making full use of their assets at work -- in fact, only 17 percent of the workforce believe they use all of their strengths on the job. "Go Put Your Strengths to Work" aims to change that through a six-step, six-week experience that will reveal the hidden dimensions of your strengths. Buckingham shows you how to seize control of your assets and rewrite your job description under the nose of your boss. You will learn: - Why your strengths aren't "what you are good at" and your weaknesses aren't "what you are bad at." - How to use the four telltale signs to identify your strengths. - The simple steps you can take each week to push your time at work toward those activities that strengthen you and away from those that don't. - How to talk to your boss and your colleagues about your strengths without sounding like you're bragging and about your weaknesses without sounding like you're whining. - The fifteen-minute weekly ritual that will keep you on your strengths path your entire career. 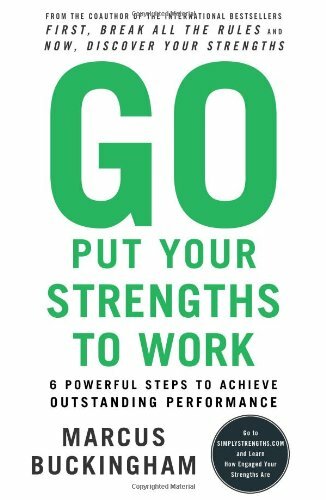 With structured exercises that will become part of your regular workweek and proven tactics from people who have successfully applied the book's lessons, "Go Put Your Strengths to Work" will arm you with a radically different approach to your work life. As part of the book's program you'll take an online Strengths Engagement Track, a focused and powerful gauge that has proven to be the best way to measure the level of engagement of your strengths or your team's strengths. You can also download the first two segments of the renowned companion film series "Trombone Player Wanted. ""Go Put Your Strengths to Work" will open up exciting uncharted territory for you and your organization. Join the strengths movement and thrive.